IMPORTANT NOTICE: Before registering please read the following information carefully as registering for this auction acts as a legal binding contract between you and Happy Trails Auctions & Sales. All disputes will be settled by arbitration in Marathon County of Wisconsin. TERMS: This is an online only auction. There will be a 10% buyer's premium assessed on this auction. Payment and settlement will be done at the onsite auction site at the scheduled pick up times noted for auction, unless your items are being shipped. All buyers that are a resident of Wisconsin will be charged 5.5% sales tax on all items purchased and buyer's premium unless a tax exempt form is given to us upon checkout. Please read through all the terms and conditions of this auction. PICKUP DATES: See checkout dates and times. Items are to be picked up from the onsite auctions location, unless your items are being shipped. PAYMENT OPTIONS: Cash, check or credit card (Visa, MasterCard, Discover, and American Express). A 3% Credit Card Processing Fee will be added if payment is made by credit card. PAYMENT MUST BE MADE IN FULL DAY OF PICKUP. ALL CHECKS FOR OVER $150 MUST BE CERTIFIED FUNDS. NO CREDIT CARD CHARGES OF OVER $500. IF YOU WOULD LIKE TO MAKE A PURCHASE OF OVER $500 AND YOU WILL NEED SHIPPING THEN YOU WILL HAVE TO SEND A CERTIFIED CHECK TO COMPLETE YOUR TRANSACTION. CREDIT CARDS BEING DECLINED: Successful bidders with credit cards that are declined on the day of payment will be charged a $35 processing fee to process an additional credit card. Happy Trails Auctions & Sales allows no exceptions to this policy. NSF CHECKS: Successful bidders with checks that come back NSF will be charged a $50 returned check fee that will be charged to there credit card or the next time they pick up and will loose the ability to pay with a check on future auctions until Happy Trails Auctions & Sales decides otherwise. Happy Trails Auctions & Sales allows no exceptions to this policy. SHIPPING INSTRUCTIONS: Any items that are to be shipped by the auction company will be charged 10% of the total value of items with a minimum $5 handling fee charge unless your item is considered fragile (mirrors, pictures, glassware, etc.) then a minimum $15 handling fee will be charged. Very fragile or large items (large framed pictures, animal mounts, large signs, etc.) may also have a special minimum handling fee per item which will be outlined in the description of that item.The buyer will be charged for insurance on the value of the property being shipped according to high bid amount and actual shipping charge from the shipper. If shipping your items the card that you have on file will be used to pay for your items. If you would like to use a different card for payment or pay by certified check then please contact us by replying to the email containing your invoice to inform us of this. FAILURE TO PICK UP ITEMS: Failure to pick up your items by the last scheduled pickup day for the auction will result in processing of your credit card for payment. If items are not picked up by the last scheduled pickup day, you must contact us (715-677-4287), otherwise the items will be held for 5 days. Items that do not get picked up by the last pickup day will be charged $15 for storage and for having to schedule a special pick up time. Happy Trails Auctions & Sales allows no exception to this policy. After 5 days, all items left become the sole property of Happy Trails Auctions & Sales and no refund will be given. Any other arrangements for shipping, transportation or physical pick-up must be made prior to the sale ending. ITEMS SOLD: Please note these assets are sold only one time with non-retractable bids. When you bid on any item, you are entering into a binding contract. If your bid is the winning bid on any item, your credit card will be charged for your purchase at the end of the pickup day unless prior arrangements have been made. All property is sold "AS IS, WHERE IS", and ALL SALES ARE FINAL. All Items are considered used condition. INSPECTION NOTICE: Property is open to public inspection at the dates and times found under Preview Dates and times. It is the Bidder's responsibility to determine age, type of condition, quality, authenticity, realness, uniqueness, genuine aspect, value or any other physical characteristics. Happy Trails Auctions & Sales may attempt to describe at best the merchandise in public advertising, on the internet and on the auction site but makes no representations at all. In no event shall Happy Trails Auctions & Sales, be held responsible for having made or implied any warranty of salability or condition for any particular use or purpose. Bidder shall be the individual judge of item's value. OFF SITE INSPECTIONS NOTICE: Bidders, who bid 'off site' and are not present at the online auction or preview, understand and acknowledge that they may not be able to inspect an item as well as if they examined it in person. The bidder is responsible for the determination of age, rarity, physical condition, value, genuineness, or any other physical characteristics. Happy Trails Auctions & Sales shall attempt to describe in detail each item and any important information regarding that item. Bidders understand and agree they are bidding over the internet and technical issues may occur that Happy Trails Auctions & Sales has no control over and is not responsible if your bid fails to be recorded, this is especially important near closing times due to high volume. Happy Trails Auctions & Sales strongly suggests you take advantage of our max bid feature so you are covered in the most efficient way possible. Happy Trails Auctions & Sales will not be responsible for any omissions, errors, or misprints in the description of any merchandise or auction items. Auction lots can be removed from the auction at any time prior to close of the auction. Bidder agrees that everything is sold "AS IS, WHERE IS", and ALL SALES ARE FINAL and that they may not return any item they purchase for any reason. OUTBID NOTICES: Please remember to refresh your screen to find out if you have been outbid. To refresh your screen, you need to click on refresh for the whole page to refresh or use the refresh button on your browser. This is most pertinent at the end of the auction. EXTENDED BIDDING FEATURE: This auction features extended bidding. Any lot that receives a bid within 3 minutes of its scheduled closing time will remain open for bids past its normal close and will then enter into extended bidding. The lot will remain open until there are no bids received on that lot in the last 3 minutes of any extended bidding. This only affects lots with the last 3 minute bids; other lots will continue to close at their normal times. When a max bid is placed, the current bid price does not automatically go to your max bid. Another bidder has to bid to increase the current price and the computer will automatically inject your bid in the next increment, continually after being outbid, until it reaches your maximum bid amount. AGE RESTRICTED ITEMS: All items that are sold that require a minimum age to be purchased will be enforced by Happy Trails Auctions & Sales upon the sale and pickup of those items. They items include but are not limited to adult material, alcohol, long guns, handguns, etc. RESALE: Happy Trails Auctions & Sales reserve the right to resell any property not paid for in full on auction day or not picked up within the 5 day storage period. The Buyer shall be responsible to Happy Trails Auctions & Sales for any expenses of resale and collection and damages resulting from the resale. INJURY & DAMAGE: Bidder acknowledges responsibility for any personal injury or property damage caused by Bidder or his Agent, and further agrees to hold Happy Trails Auctions & Sales, Owners, its Officers, or Employees harmless for any personal injury to himself or his Agents and any property damage incurred on auction premises during preview or pickup. MISC: No refunds will be given. Happy Trails Auctions & Sales reserves the right to alter this agreement at any time. This will take place by updating this website. Please check back and review these terms every time you use this site you are agreeing to the terms as they are written at that time. 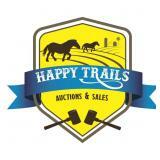 Happy Trails Auctions & Sales reserves the right to cancel any auction at any time for any reason. All sales are final. A bid is a legal binding contract between you and Happy Trails Auctions & Sales. Happy Trails Auctions & Sales reserves the right to reject any and all bids for any reason. Bidders agree to keep their username and password confidential as they are responsible for ANY and ALL activity involving their account. When using this web site you must obey any and all local, state, and federal laws. Violations will result in termination of web site use privileges. Auction company employees and/or the auction company may bid on auction items. We gather aggregate information from this web site which may include but is not limited to: number of page visitors, most visited pages, any and all correspondence. Thank you and good luck bidding! Antique Chase Horse Hair Sleigh Blanket - 52" x 70"
2 Cast Iron Pans - 9 1/2" & 10 1/2"
Fuel Oil Water Tank Heater ?